I have been exploring the possibilities of creating a painting brought to life. With that goal in mind I produced an unusual fusion, Lucid Dream, being both one of my latest experimental films and one of my earliest. The movie was given a painterly impressionistic look by digitally post processing an "animated dance" originally shot on Super 8 film circa 1980! The vintage source film utilized the technique of pixilation: humans animating themselves via stop-motion animation. Featured are performances by artist/gymnasts Mark Daniel and Ben Averill, who frequently collaborated with me on pixilation projects. Ann Olson and Mary Niebauer were guided through the process, as they had never tried anything like it before. We started with some pre-conceived ideas and planning, but overall the actual animation was spontaneous, self-evolving, and fun. A pixilation performance of this type required a mind-body awareness, and collective interaction. The final result was dreamlike, mysteriously moving figures interacting with the natural environment. I was generally pleased with how the film turned out, but there were a number of flaws in the animation that kept it from being great. However, it was excellent source material for the new improved version which happened many years later. 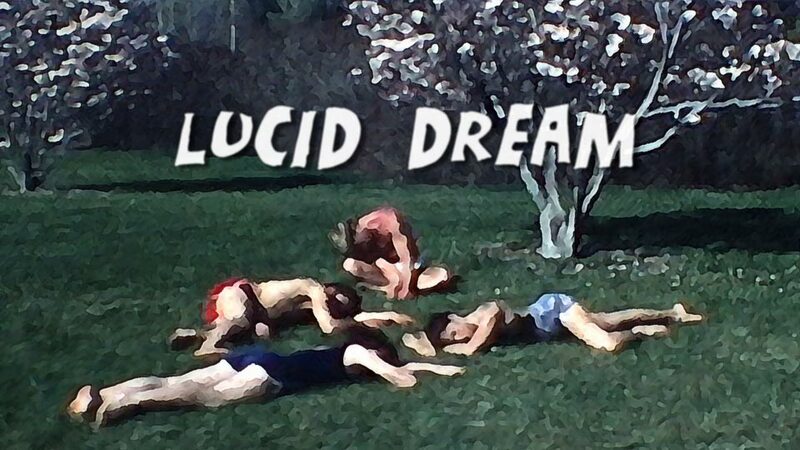 I used several software packages as my tools to fix and revitalize Lucid Dream. The animation glitches were smoothed out by re-posing the figures frame by frame with Photoshop. I created subtle camera moves to follow the action, and cropped the aspect ratio to the modern HD 16 x 9 with Final Cut Pro. Cropping in on a tiny Super 8 frame loses a lot of image quality, but in this case it did not matter as each frame was transformed in the next step. The transmutation into a "painting" was achieved with the graphic synthesizer Studio Artist, a relatively unknown software. I spent more time than I would like to admit experimenting by trial and error to develop a look that I liked. Ultimately the result was a hybrid movie that salvaged an old project and explored new territories in the realm of visual arts.